You have to love golf team building in New York, NY. FPC National was holding their annual owner’s conference in a meeting room overlooking Times Square in New York, NY. This company is a nationwide leader in executive search and recruiting for executive and management jobs. In addition, FPC is also a trusted partner whose relationship-based business emphasizes commitment and long-term value. All franchise owners were in NYC for days of learning and to spend time together. 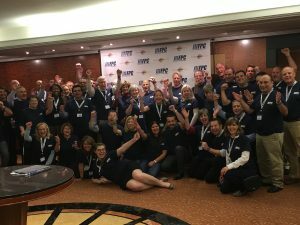 There were many workshops and presentations and the team was ready to get active when The Leader’s Institute ® Instructor Michelle Riklan arrived. The company CEO and President, was geared up and ready to participate, not knowing 100% what to expect! Danielle, the Office Administrator and Marketing Assistant, was on hand to help coordinate the logistics of the Ace Race ® Golf Team Event. Before we began our main competition, the group participated in several activities in teams, and with partners. They learned a great memory retention activity, showed off their coordination skills, and gave the Dallas Cowboy Cheerleaders a run for their money! 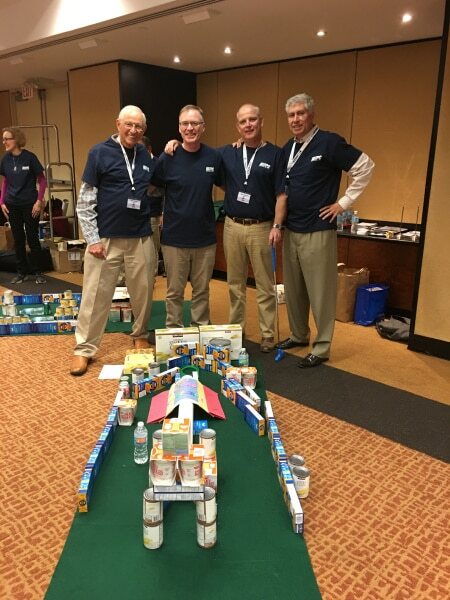 Then, participants built a mini golf course out of non-perishable food items for charity. Teams got creative! The play was competitive as each team displayed their mini-golfing skills and worked through the entire course. A great time was had by all and at the end of the event, The New York City Food Bank collected several hundred dollars worth of soup, pasta, vegetables, mac and cheese and more. Are you looking for a team building event in New York? Details and a request information form are available at https://www.leadersinstitute.com/locations/northeast-region/new-york-ny-team-building/. Michelle is our local instructor in the area and covers a territory from Philadelphia to Boston and all of New England! Her schedule fills up quickly, though, so call (800) 872-7830 now for details.